If you spend a lot of time in your cooking space with family or friends then you know it is not only a place to whip up meals — It is also a spot where you create memories. And that makes your kitchen the heart and soul of your home. So when it comes to remodeling, you want to get it right. That is why we wholeheartedly endorse a white or mostly white color scheme. Unlike bolder hues, the neutral shade will not fall victim to fickle decorating trends. To inspire you to create a white kitchen that will get your ticker thumping, behold our 17 favorite examples. Interior designer, Michelle Gage dressed up this white kitchen with a mermaid inspired backsplash. The Moroccan fish scale tiles are by Mercury Mosaics. Their beautiful blue and green colors evoke the sea while giving the cooking space a beachy vibe. The brass accents, which includes the cabinet hardware and kitchen faucet, also make a big stylish, splash. The vintage-inspired, modern white kitchen in this charming bungalow remodeled by Sarah Phipps Design got an updated look using a combination of new and salvaged building materials. The flat front cabinets are a consignment store find. The brass pendant light over the sink came from World Market. The hexagon marble tiles used to create the backsplash were picked up at Home Depot. The white SMEG refrigerator enhances the overall retro vibe. If you crave girlie glamour in your kitchen prepare to fall in love with this cooking space by Laura Burleson. The white cabinetry is topped off with beautiful brass hardware. The drop-dead gorgeous range is from The Majestic Series by Ilve Appliances. The sprinkles on top are the lantern pendant lights painted bold pink. Two-toned cabinetry adds dimension to this white cooking space updated by Grant K. Gibson Interior Design. The matte, upper cabinets are designer white by Benjamin Moore. The crisp, subway tile backsplash beautifully reflects light throughout the space. The marble countertop is a neutral bridge between the two-toned cabinetry. The brass cabinet hardware compliments the black kitchen range. The design team at Studio McGee proves that simple changes can make a significant impact in a kitchen. They did only two things to update this cooking space. The original dark countertops were swamped out with white marble. The old, oak cabinets got a couple of coats of white paint. The finished result is a kitchen that feels brand-new. Here is a modern take on the traditional white kitchen by House of Jade Interiors. The painted walls and cabinets are a shade called snowbound by Sherman-Williams. The marble look countertops are durable quartz by Pental Surfaces. The black pendants lights over the kitchen islands are from Rejuvenation. The natural wood shelves, rattan counter stools, and sprigs of greenery add visual warmth to the fresh, white space. Interior designer, Holly Mathis gave her modern, cottage kitchen a sprinkling of retro flavor with vinyl floor tiles. The black and white pattern adds a heaping dose of whimsy. A white, brick wall sets the tone in this chic, Scandinavian-inspired kitchen by Blakes London. Shelves and lower cabinets in a soft-toned natural wood add textural interest. The countertop was cut from a slab of Carrera marble. The crowning jewel in the cooking space is the white AGA range. White couples beautifully with every shade of the rainbow. In this tiny white kitchen by Finesse Design Remodeling, a painted orange backsplash adds zing. If the bold hue starts to feel tired, refreshing it with paint will be a cinch. Here is a sophisticated white kitchen by Turek Design. The black marble countertops pop against the traditional white cabinetry. The marble, subway tile backsplash is a luxurious touch. We also love the antique-look brass fixtures that feel way more modern than then their shiny counterparts. 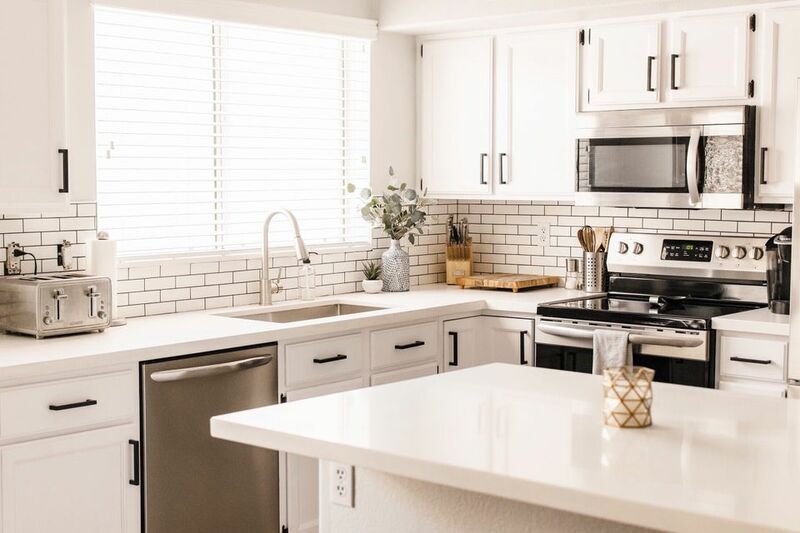 These flat-front cabinets custom made by the remodeling team at The Jack and Mare Design Build give this white kitchen a clean, modern look. The blue kitchen island adds an element of fun. Because a very active young family with pets lives in the home, the floor is waterproof luxury vinyl. Colorful accents punch up this white kitchen by D2 Interieurs. Over the counter are two apple green pendant lights. The rustic wood counter stools are covered with patterned fabric. The renovation experts at Bunker Workshop added much-needed storage for cooking utensils to this modern white kitchen by installing a red pegboard backsplash. The shiny metal countertops are stainless steel. The interior design firm, Heidi Caillier added some windows before creating this Scandinavian-inspired, modern kitchen. White subway tile covers the entire wall over the sink. Brass task lighting illuminates the work area. Our favorite feature is the wall of concealed storage on the right.